This blueberry cake bars recipe is made in a 13x9-inch pan and is as easy as pie, except it isn't pie! The recipe comes to me by way of my friend Diane who got it from her friend Bernie who got it from someone else! It's just a darn-good cake that's simple to make and is perfect for an abundance of blueberries. When Thanksgiving and Christmas roll around, substitute fresh cranberries for the blueberries. Or try pitted sour cherries. The batter is sweet enough to be able to use the tart fruit and still call it dessert. 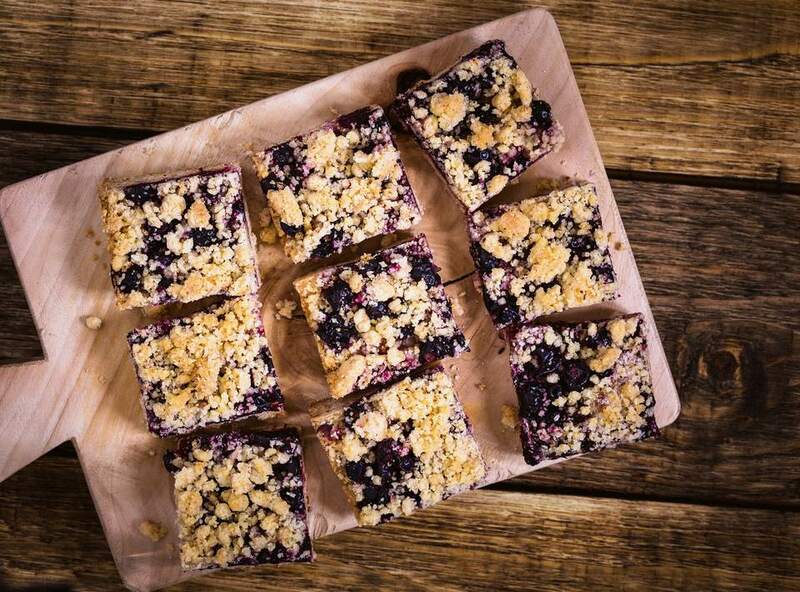 Here are more Eastern European Blueberry Recipes. Heat oven to 350 degrees. In a large bowl, cream butter with sugar for 5 minutes. Add eggs and beat another 2 minutes. Mix in flour and almond extract. Fold in blueberries and pecans until well combined. Coat a 13x9-inch pan with cooking spray (and dust with flour, if desired). Spread batter evenly in pan and bake 45-50 minutes or until toothpick tests clean (except for blueberry juice). When cool, sprinkle with confectioners' sugar. Cut into bars of desired size. Serve warm or cold with fresh blueberry sauce, if desired.